One wing of this hotel was struck by lightning and wrecked in a storm in June 1893. Not long after, the hotel narrowly avoided being burned to the ground when the Market Hall next door caught fire in July 1907. The hotel suffered considerable water damage. The Victoria Hotel was described in 1855 as having ample accommodation, well-aired beds, and coaches going to and from Bangor in summertime. 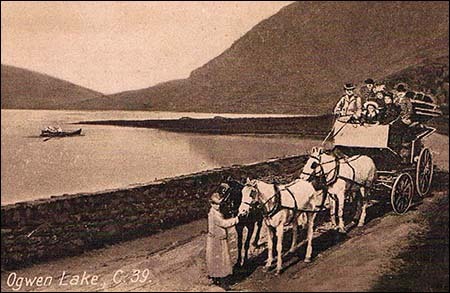 In the 1860s, “large and commodious” omnibuses “driven by sober and experienced men” also took visitors to the nearby slate quarries. The picture shows an omnibus of the period at Llyn Ogwen. In 1891, the hotel’s outgoing tenant sued the incoming tenant for the price of a new linoleum floor covering! The new tenant claimed the hotel’s owner, Greenall & Whitley, had paid for it, but she was told to pay £4 10s. The Bethesda Agricultural Show committee met here for a supper in 1897. It was noted that the show had “done much to improve agriculture and horticulture in the district”. The tradition continues, with the Dyffryn Ogwen Agricultural Show held every June on Bethesda rugby fields. During the Great Strike (1900-1903), many disturbances centred on Bethesda pubs. In July 1901, 300-400 people gathered outside the Victoria Hotel “and took possession of the whole street”, saying there were “traitors” inside. The hotel’s windows were smashed in January 1902. In 1905, retired stonemason William Hughes left the hotel drunk, knocked himself unconscious and was taken to Dr Griffiths’ surgery. Dr Griffiths testified in court to William’s drunkenness but William asked: “What is the difference between a drunken man and a half-drunken man?” Dr Griffiths replied that the surgery reeked of beer and whiskey after William’s arrival and that Williams “began composing poetry” (laughter in court). “That,” declared the doctor, “is what I call drunk.” William was fined 5s while landlord Alfred Green was found guilty of permitting drunkenness on the premises and fined even more: £2 and costs.